After a catchy Subject & Body of email, the main thing left is the Email Signature. After writing the complete email the question arises that Which Email Signature Should I Use which looks professional. 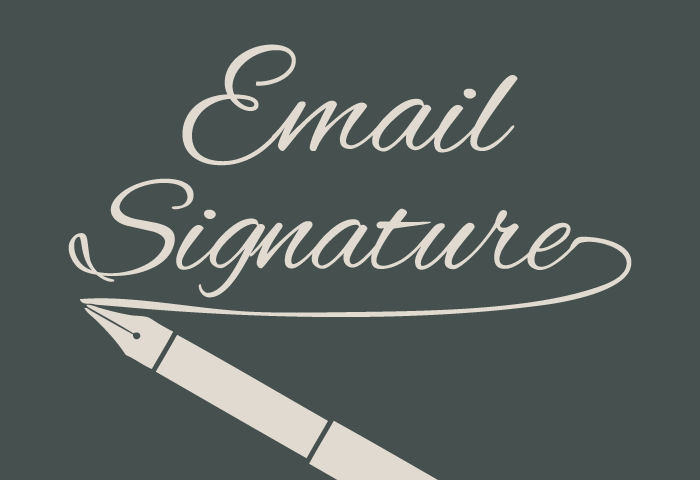 There are lots of email signatures and deciding one of them is the difficult task. You need to keep in mind many things while selecting the email signature for your Individual emails or the Business emails. Email Signature leaves a very good impression on the reader. If you use the proper Email Signature then the whole part of the email looks good. And a bad email signature can ruin the whole content of the email. So, always be careful while deciding the email Signature. The Email Signature should never be so long and not so small. Email Signature differs to everyone according to their writings and the purpose of the email. Here in this article, we have mentioned some cool tips to choose a perfect email signature. If you follow these tips then you can grab a perfect Email Signature for your business or whatever purpose you are using for. Whether you are a company or an individual make your Email Signature social. Put your Social Profiles link as the icons in your Email Signature so that the reader can get in touch with you easily and the email looks trustable when you add your social profile. The reader will believe that email is sent manually by the human, not by any bot. Sometimes to make the Email Signature attractive we try to add different type of colors, images etc. which makes it look odd. Use only a few light color to make it look attractive but excess use of colors will make it animated which isn’t good at all. While making the email signature make use of the proper tools. If you are using the logo in email signature then use proper dimensions and make it fit in the proper size which looks good in all type of devices whether it’s mobile or the desktop. Another thing while choosing the email signature is that try to keep it short, don’t put unnecessary things in the signature. Just add things which are necessary such as logo, social icons, details about the company or yourself. So, these were the few good tips to choose a perfect Email Signature for yourself and the company to look professional. Keep these things in your mind while making the Email Signature, rest depends upon the purpose of email address. Sometimes you don’t even need to add Signature so avoid using Signature in such emails where it is not necessary.